During your first visit, Maarten de Vugt will try to get a complete picture of you as a patient. He will ask you some questions and will investigate movement limitations in your body and the underlying cause of your symptoms. The osteopath will investigate the cause of any movement limitations in your body and will treat you with gentle manual therapy. He will also focus on the impact of your lifestyle on your health. If signs are present of an underlying disease for which no treatment can be provided by osteopathy, the osteopath will always refer you (back) to your general practitioner or specialist physician. If necessary and desired, he will work closely with other health care providers. The osteopath will look for movement limitations in the body and the reason why the body does not heal itself. Movement limitations can be caused by an accident, illness, surgery, stress or a poor diet. It sometimes takes a long time before symptoms arise from such a trauma, because the body will first adapt itself to a problem. If then over time this compensation mechanism can no longer be sustained, complaints arise. Restoring the mobility of the tissues will then lead to restored function and balance. By treating the movement limitations steadily the body will get its self-healing capacity back and regains balance. This process decreases complaints or resolves them. Investigations and treatment will only take place by using hands. The osteopath can also provide advice in the area of nutrition and exercise, and he will try to provide insight into the causes of the disturbances within the body. Attention to your lifestyle such as eating, sleeping, drinking, work, play and relaxation are important to aim for optimal health, as well as your physical and mental awareness. Maarten will study the influence of your lifestyle and diet on the tissue and cell balance of your body. If there are blockages this could imply that nutrients are not reaching their target area. By careful palpations the osteopath restores flexibility of the different body parts in order to improve the fluid circulation in the body. This should allow the body to heal itself. The therapy sessions are therefore not compressed in a short time period, but with are succeeding each other every 2-5 weeks. A therapy session takes about three minutes to an hour. 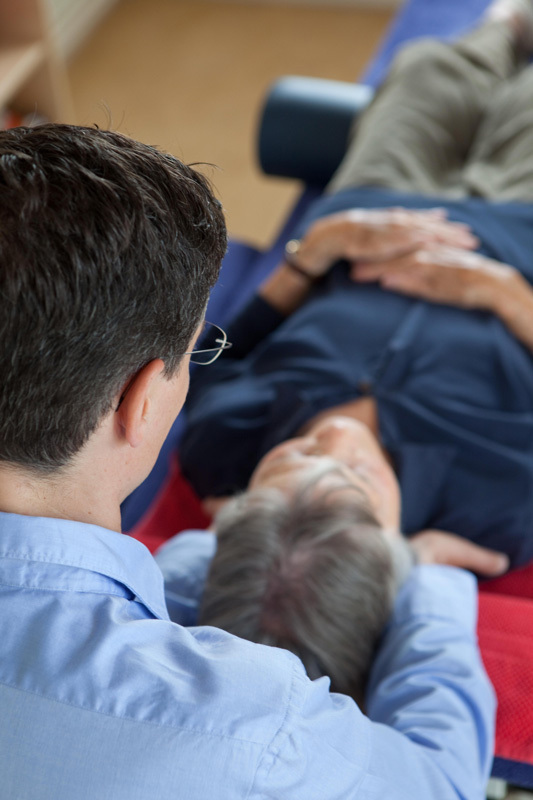 The response to an osteopathic treatment is different for everyone. It may at first be associated with increased or decreased symptoms, with headaches, with sensations of cold or heat, with fatigue, and also with emotional reactions. For children, the cost of an osteopathic consultation of 45 minutes is € 92,50. A consultation for adults takes about an hour and costs are € 104,- VAT included. You can pay at the practice with a debit PIN-card. You will get a copy of the invoice for your insurance company. Many insurance companies reimburse the costs of treatment or a portion thereof. This is also depending on the type of insurance policy that you select. A list of qualified osteopaths and more general information about fees can be found on the website of the Dutch Osteopathic Association (NVO), the Dutch Register of Osteopathy (NRO) and the Dutch Osteopathic Federation (NOF).